Today E-Tailers offer a variety of fast shipping methods, some as fast as one day. 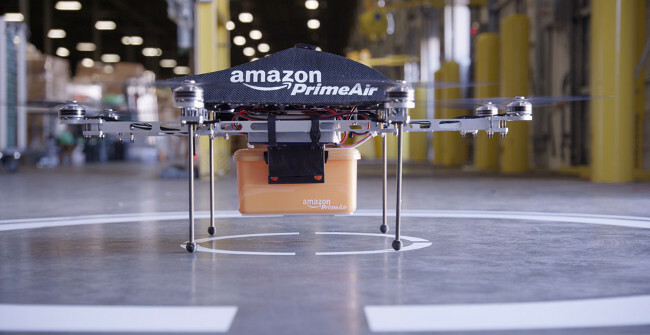 Jeff Bezos, CEO of Amazon, promises to make one day seem like a non-premium with 30-minute deliveries via Prime Air. Prime Air is a project Amazon is currently working on, that will bring near instant deliveries on small packages. It all starts with a small drone, also called an octocopter, which waits on a conveyor belt waiting to pick up a package in a small yellow bin. Once the package is picked up the drone will fly to the customer with in 30 minutes. As of now there hasn't been a lot of specifics, such as how much the octocopter can truly hold. With 86% of packages weighing less than five pounds, it's safe to assume Amazon aims to hold items weighing in around five pounds or under. The exact time of availability is also unknown, due to the fact that Amazon still needs to work out flaws in the project. One major speed bump as of now is the fact that the FAA currently bans the commercial use of drones in residential air space, and it is predicted this law will be in place until 2015. Prime Air seems like a fairly unique, futuristic idea. With combination of technologies like Intel's Smartfridge and Prime Air we could see some rather amazing things being done from an average citizens home, but there are still a lot of issues with Prime Air other than the FAA. One issue that comes to mind is how easily these drones could be taken down, or how they could be easily destroyed via Mother Nature, or how much they could cost. If and when Prime Air gets launched, do you think you will be using it? If so, how much would you be wiling to pay?